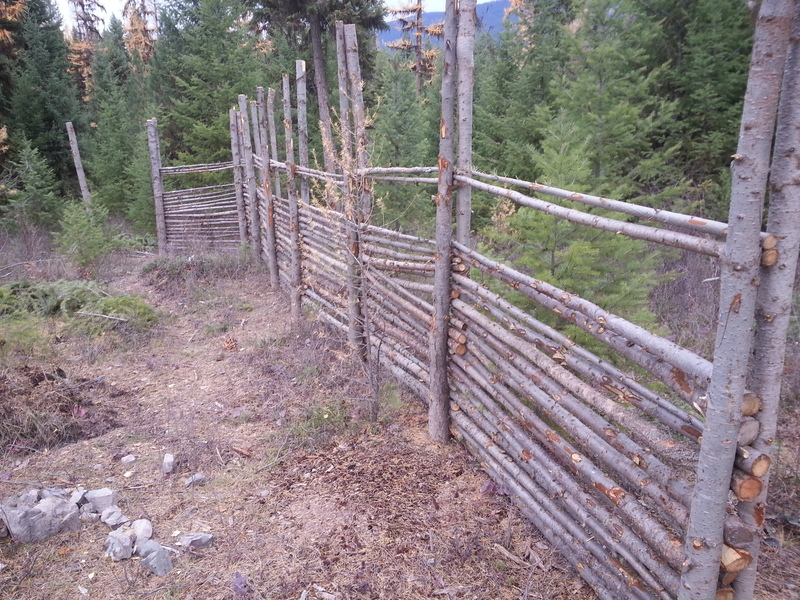 We needed a permanent fence that would keep flighty chickens (layers) in and keep the deer and the wild turkeys out. We experimented with a few designs that all ended up being awful. 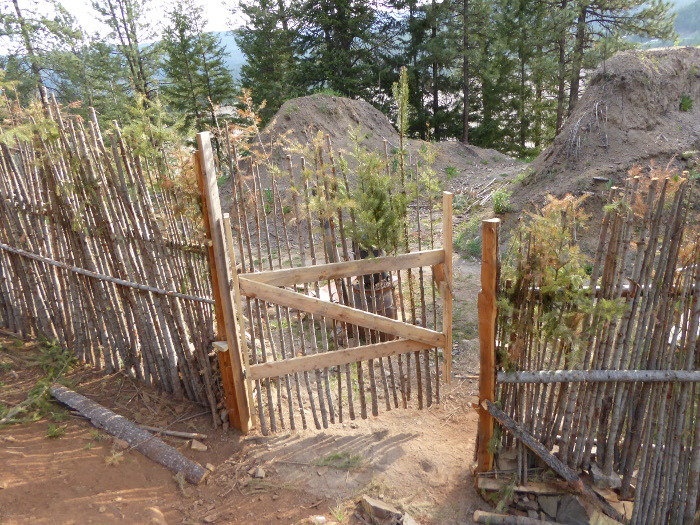 And when we tried this design, the fence went up mighty fast and cheap. The wood being used as the "filler" is from thickets that are already so packed, the the gub'mint pays people to cut it down in the name of "reducing fuel load" (forest fire danger). Normally 95% of these small poles will die and then get super dry and become a great spot to help a forest fire. What nearly everybody does around here is to make a big pile of this wood and set it on fire in winter when it won't cause a forest fire. But rather than needlessly burning this stuff, I like the idea of using it. Fenceposts where you expect. Three poles that will hold the junkpoles in place. 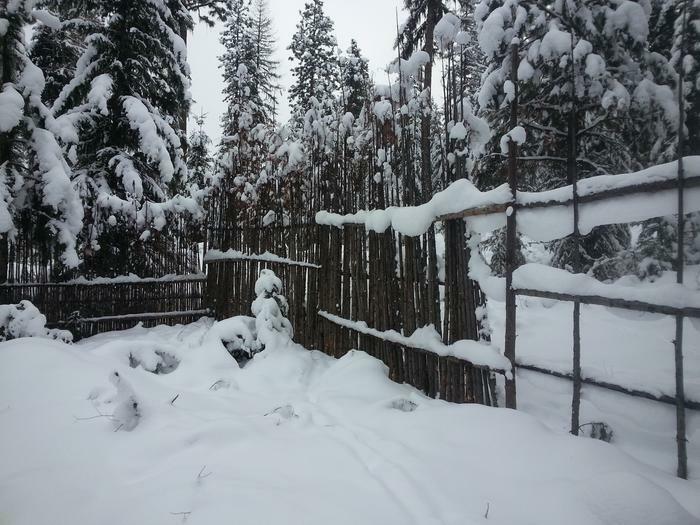 The top and bottom poles are mounted to the posts and the middle pole is mounted to a few junkpoles. This costs about $2 to $5 per hundred feet of fence. Once you have the materials gathered, it goes up pretty fast. People were tempted to put the junkpoles in where the fat end alternates every other pole, but I think it is important to always keep the fat end down. 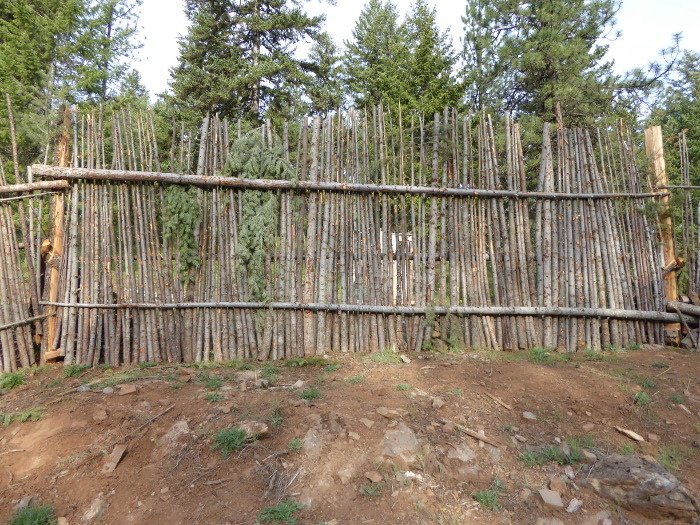 This makes a strong barrier along the bottom to keep the chickens contained, and a "good enough" barrier at the top to keep flying chickens in and jumping deer out. 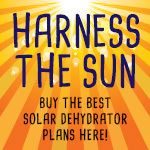 Plus, it allows more light to pass down to the growies. There is concern about rot along the bottom, but if rot does occur, then the poles will just slide further down as needed. Only a few junkpoles are attached to the fence. The rest are loose-packed. They just slide right in mighty quick. This design makes for using just a few screws or nailes (we used screws) - thus keeping the materials expense very low. Gaps in the fence are easily mended. Sometimes some of the junkpoles want to gather up - so we put little spacer sticks in. Sometimes there is a curve in the bottom of the junkpole, so we put a few rocks in. 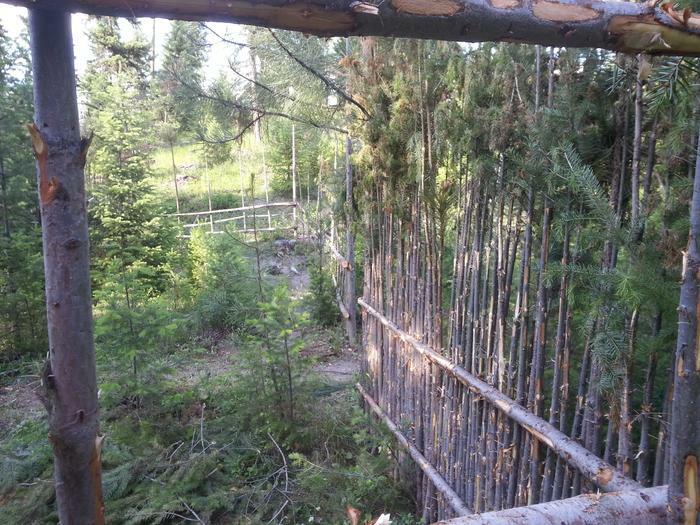 I think the junkpole fence design is similar to "twig fence", "brushwood fence" or "stick fence", but none of those seem to come close to what we did here. So a new name seemed justified. Since this is a brand new thing, it is possible that as the years pass it will become a terrible idea. I hope to keep you all updated. I also hope that we will get more pictures in this thread - as it seems a lot of other people like this idea. 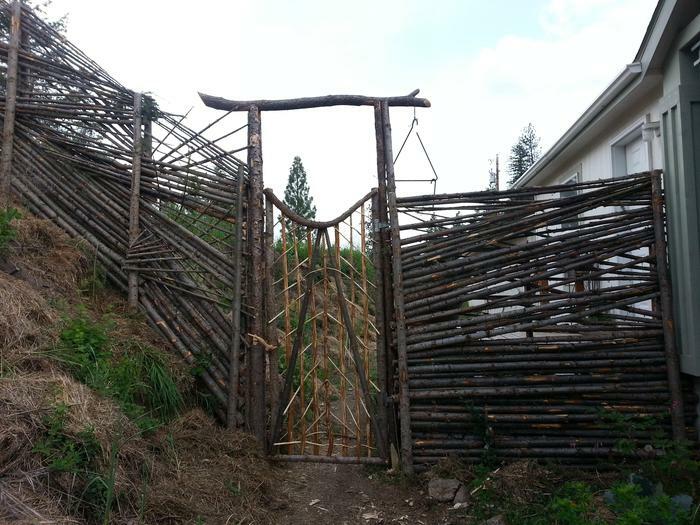 In comparison, we built some field fence too. It was running about $150 per hundred feet in materials. It did go up three or four times faster. Most of the time came from gathering the wood that would be used. But a lot of time went into going to the store to get the field fence material (plus, you could say there was some time that went into earning the money that paid for the field fence material). I also think that the aesthetic of the junkpole fence is much better. I started a thread about this earlier, but this new thread is an attempt to express this stuff a bit more clearly. I had two more points to emphasize. One is the idea of how you can save a few screws and make a stronger fence by toenailing the middle pole into the fence post. But I am reluctant to say this because less skilled people will then attach the middle pole straight to the post (without inset - to avoid the toenail). So I made two more images. One showing the better way and one showing the "don't do this" way. Once you have the materials gathered, it goes up pretty fast. 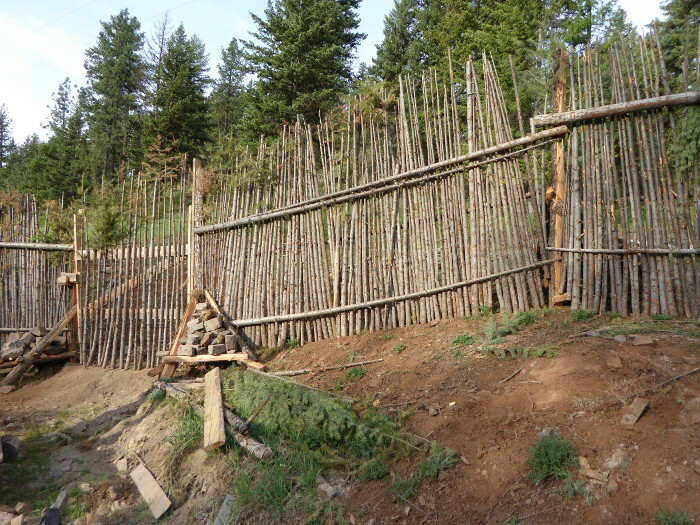 In comparison, we built some field fence too ... [which] did go up three or four times faster. I love it. So how fast does a junkpole fence go up once your poles are cut? Do you have a rough idea yet of feet per hour? I love it. I was thinking I didn't have any wood like that on my property, but then remembered it's everywhere! Say what?! I liked this fence before, and the aesthetic really works for me, but that really cranks up the awesome factor IMO. Stacking functions! I'll be very interested to hear what eventually fails first. My bet is the thin end of the horizontal poles... as you say, rot at the bottom of the the junk poles should hopefully be auto-compensated via gravity. Has a rather colonial appeal to it....Fort Wheaton? Here is Sir Chops, testing the junkpole fence. It seems to be working well so far. I have more junk dimensional lumber than I do junk wood, but I can still see using this system and saving my self bucks on good fasteners. 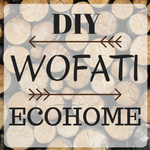 Even if you where using lashing or wooden pegs, you would save time in fashioning either of those things by using this method. I like raised beds, I wonder how this meathod would hold up if used to contain a lasagna bed . Brilliant! I like that no fasteners / no hardware is needed at all. I watched this video in the search you provided, and even though I can't understand any of the narration, it is so demonstrative that it looks incredibly instructive any how. 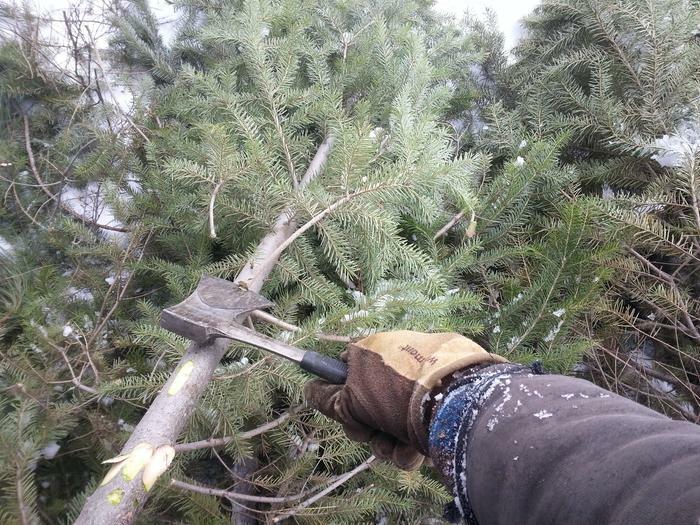 2) you use nice young/end branches of pine to fasten the poles. best way being to trim away the smaller bits, fire harden and strengthen the branch in the fire, then use that super awesome lashing technique. also, note he *twists* the branch as he bends it around the pole. that twists the fibers in the branch and makes it stronger and less likely to just split apart or snap and break. 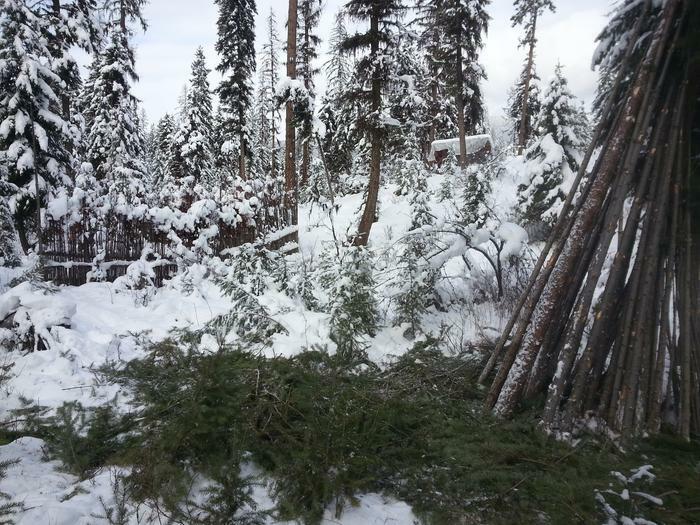 3) you wont always have perfect thin strong branches to use so you can split bigger branches down. good way of that is to trim off the crap from the branch, cut the real thin bit off the end, and split the branch from the top of the branch working down. I am guessing this works like how if you peel a banana from the odd end then you wont get the silky bits string out and on your banana. this way keeps it a nice clean split. Yeah, I thought it was brilliant too...I'm half Swedish and am surprised I never heard of them before. 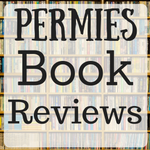 I watched a bunch of the YouTubes, and read what I could find too. I think putting the green boughs in the fire steams the wood and softens the lignin, enabling that twisting and turning without breakage; it cools and sets in the new contorted form. Some are made with peeled poles, some unpeeled, and if the timber is too big, they split it. I think they're very pleasing in form, and could be made pretty stout. They do have a Scandinavian vibe. I may have to try this, although it is labor intensive. Still, not too bad since you don't have to sink deep post holes or peel the poles, which are also easy to come by. I think they'd last awhile up here, where cold winters are long and summers are hot and dry. Probably not so much back east, unless they're made of cedar or something. 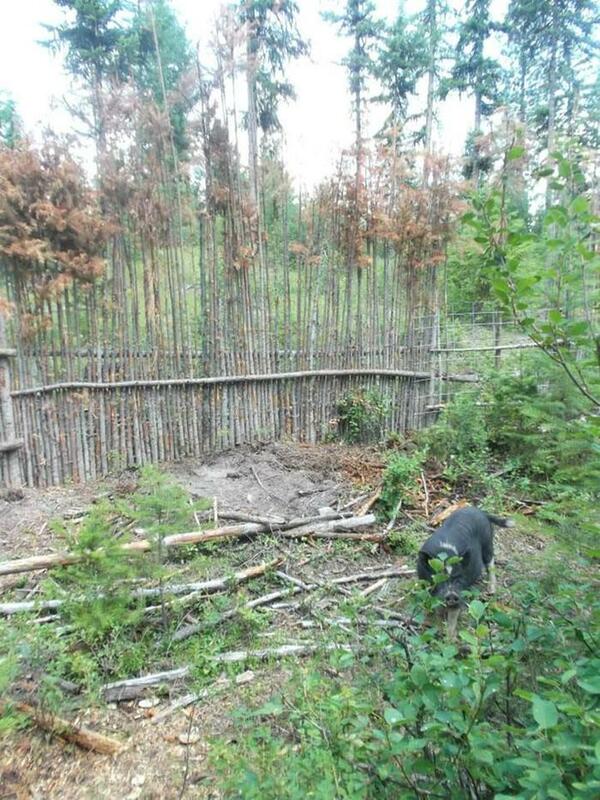 Would this fence keep Mr Bear out ? Or Deer in /out ? Evan's junkpole fence on hold this winter as he gathers more junkpole. The aesthetic has a treehouse/kids fort/ ancient retreat center kind of vibe that i like. I might try to imitate the design on a small scale with my brush piles. These fences are beautiful. I too am concerned about their longevity though. One idea I have is build a junkpole fence, and then plant your living hedge plants right next to it. The idea is, once the junkpole fence falls apart, the hedge plants will have reached maturity, and the fence will mulch your new living fence. That video is awesome! It turns the problem into the solution for the way I was making junk pole fences! Problem= I have to use screws and the branches and small saplings usually aren't even worth cutting unless I'm tripping all over them. Solution= Use the saplings and branches for fasteners! I didn't see anything in the video that was over about 4ft. I wonder if it would be possible scaled up to 8ft. It's amazing that fire can make the whips so flexible! I wonder if they have to be used immediately after getting fired of if you can fire them all at once and then store them while maintaining that flexibility. I also wonder if Douglas Fir has that same property. Burning the posts and setting the end rail on a rock is another very simple solution that I hadn't ever thought of. If anyone has any possible answers for the above wonderings I'd love to hear about them. Kai, it appears you can scale these up to any reasonable size--click the second link below and you'll see plenty of examples. Eight feet appears eminently doable. I'm thinking they use the whips right away because the fire steams them and makes them flexible. I've never built one, but it's on my list. 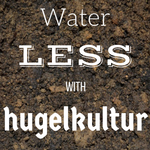 The materials are basically free, and they're also quite attractive and functional. This certainly creates a lot of room for experimentation! 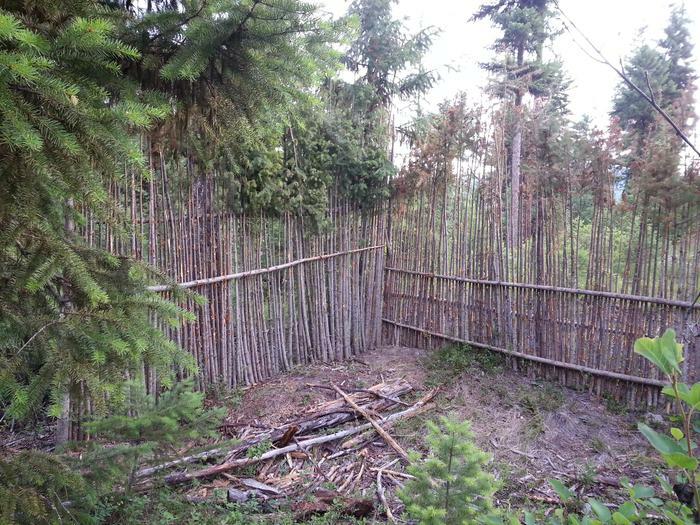 In this article (Traditional Swedish Fences) there is flimsy evidence that fir saplings/boughs are soaked before use, which would be useful in building fast without fire albeit an uncomfortable approach in winter. The issue with using bailing twine comes with having animals around. The twine eventually comes apart, or frays loose, or you end up loosing bits, and it tends to end up in the stomach of animals. The twines not digestible, even the natural stuff, and it's been known to kill animals. From horses and cattle, and I even know of a dog that had to be put down because of it. It might be ok for say, use in earth bag construction, or the sort, but not for something like a fence. At home we did a lot of square bales, natural twine, and ALWAYS when you cut a twine you had to pocket it or burlap bag it and take it with you. If nothing else a cow would always seem to get wrapped up in one or trip over it. We refused to use artificial twine or wire as that stuff never disappears. We often buried the used twine in the muckpit to rot away. 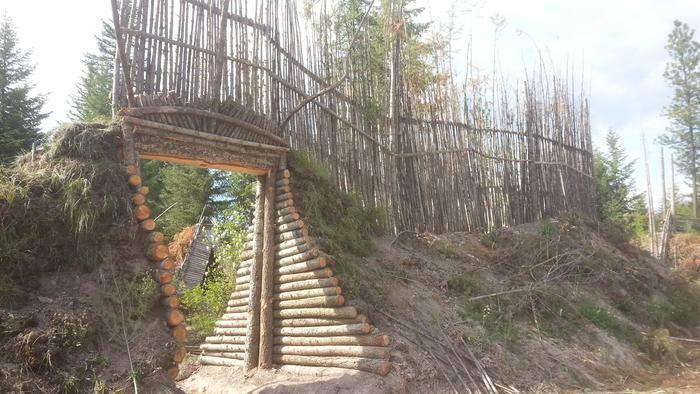 I have some brush clearing coming up and this looks like something rustically wonderful to build as a perimeter fence on the tree-scape and rhubarb beds, just enough to keep the wanderer and stray dogs out, plus be something that adds 'character' to the site. Thank you! Deb Rebel wrote: At home we did a lot of square bales, natural twine, and ALWAYS when you cut a twine you had to pocket it or burlap bag it and take it with you. If nothing else a cow would always seem to get wrapped up in one or trip over it. Thank you so much for this. I've developed a bad habit of leaving baling twine where I opened the bale until it piles up and then collected it in one go. Thus far it's been fine with my sheep and pigs, but I am looking to get into cattle when I get on larger land and- during the establishment phase when I'm likely to be supplementing with hay periodically- this could have been a disaster. So much better learning my lesson BEFORE screwing something up. You're welome. Cows are both dumb and smart, and it's a strange mix. In the barn we had a place we would hang the twines that they couldn't get at and if you needed one to tie something up one was handy. When there got to be a lot, we'd remove them and take them to the muckpit. The other issue was gophers. Not prairie dogs, those are bigger and protected in some areas. We had a continual war with gophers and filling in their burrow holes. A cow could run through and drop a foot in there and break a leg (which equaled 'burger' and an emergency butchering). Our way of thinning them was sit in the back of a pickup in the pasture and shoot them with a .22 rifle. Bait caused issues so we did it the direct route. It was important in early spring to spend a few afternoons out there thinning them out to keep the population down. Then go out with the tractor and fill things in. If anyone knows how to deal with prairie dogs, without killing, let me know. Where I live now we have those. Kyrt Ryder wrote: The other issue was gophers. Not prairie dogs, those are bigger and protected in some areas. We had a continual war with gophers and filling in their burrow holes. A cow could run through and drop a foot in there and break a leg (which equaled 'burger' and an emergency butchering). Our way of thinning them was sit in the back of a pickup in the pasture and shoot them with a .22 rifle. Bait caused issues so we did it the direct route. It was important in early spring to spend a few afternoons out there thinning them out to keep the population down. Then go out with the tractor and fill things in. If anyone knows how to deal with prairie dogs, without killing, let me know. Where I live now we have those. I've seen pigs dig up moles for chow, I imagine the same goes for Prairie Dogs and Gophers. That's part of the reason I intend to rotate pigs in pasture behind Cattle [with scratching poultry- either Turkeys or Chickens- coming in behind to clean up the mess the pigs left behind. 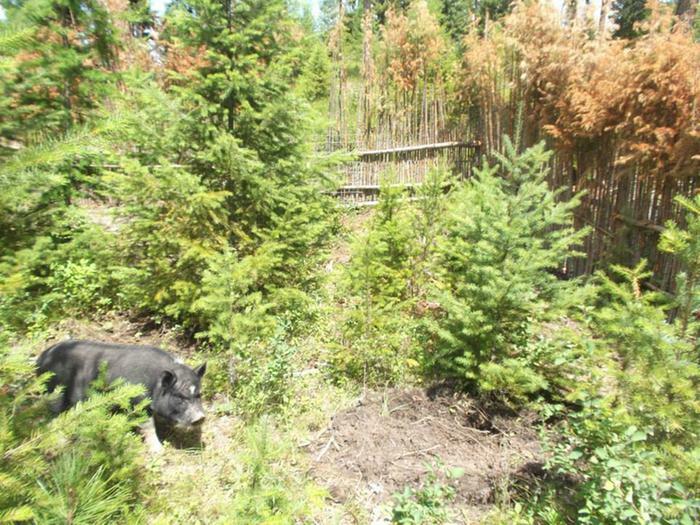 It's doubtful pigs would eliminate the population without being left in there far too long for the pasture's health, but in many cases population control is all you need [and desire? considering the soil building work done by burrowing mammals. How nosy are your neighbors? 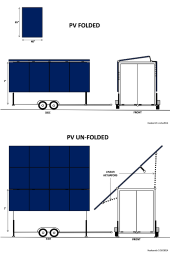 With a visual blocking fence [maybe junkpole and a visual screen hedge combined?] you might be able to manage wing-clipped muscovies at least? Two acres is a lot of land to have zero animal pest control. Kyrt Ryder wrote: How nosy are your neighbors? 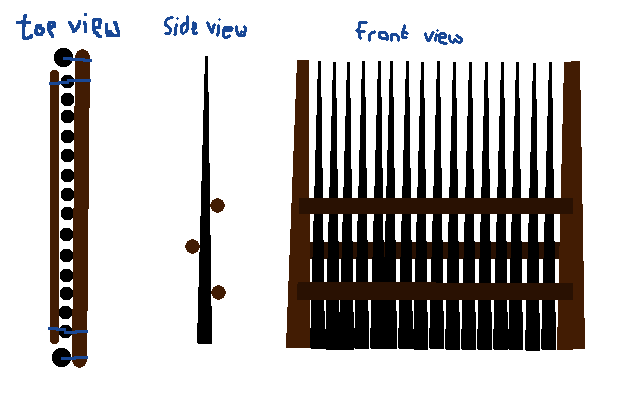 With a visual blocking fence [maybe junkpole and a visual screen hedge combined?] you might be able to manage wing-clipped muscovies at least? Two acres is a lot of land to have zero animal pest control. It doesn't take long for someone to figure out someone else is keeping fowl. I've threatened a few times to get guinea hens because I do have that patch that I can legally keep fowl in. They WOULD keep the bugs down. It's just not worth the fight, and as it is I have semi-quasi relationships with the neighbors on both sides right now because of their dogs. We're not going there right now. Kai made some really cool proenneke style hinges, but .... ended up going with a metal hinge. I proposed something like this. The purple is a fatter pole that sits on top of a branch from the baseplate log. The black is something that holds the pole in place, but allows the pole to turn. 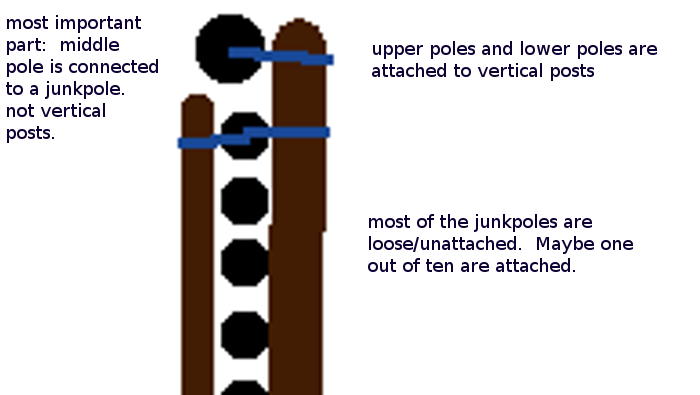 Then the rest of the junkpole hangs on the big vertical pole. I was going to have the pole have a pointed end that sits in a hole in the base log, but then I thought that the hole would fill with water and encourage rot. paul wheaton wrote: Kai made some really cool proenneke style hinges, but .... ended up going with a metal hinge. 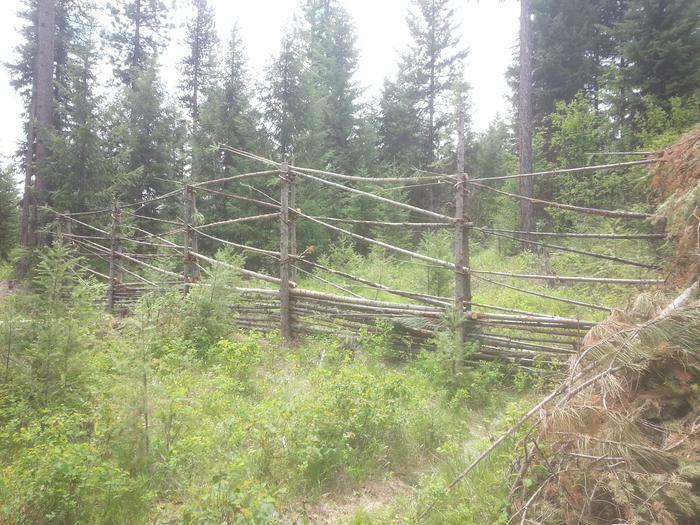 I was looking at the lodgepole fencing earlier today, and will save this one to try. What kind of fence around orchard for deer protection?